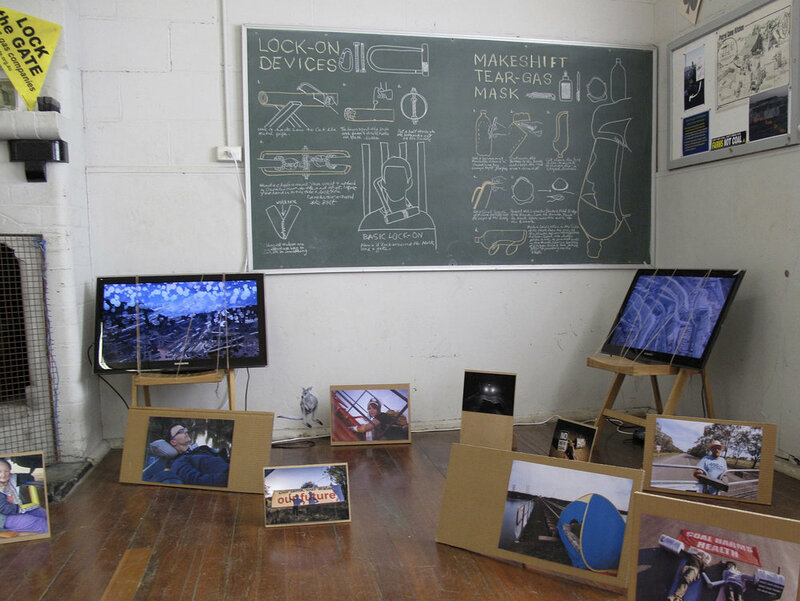 Kandos Scout Hall hosted WRVAP’s Instruments of Democracy installation + performance for Cementa15. The town of Kandos (90 km north of Lithgow) was until 2011 home to a thriving cement-making industry. Despite sustained pubic protest and numerous arrests, in late 2014 Whitehaven Coal began razing koala habitat in the Leard State Forest south of Narrabri, for its Maules Creek coal mine. My domestic koalas were harvested from eBay. Turning one’s back is a form of non-violent direct action. Our 7-minute performance each morning and afternoon of the 4-day biennial attracted good audiences. WRVAP artists (l. to r.) Toni Warburton, Suzanne Bartos and Juliet Fowler-Smith mid-performance… Toni ‘witnessing’ the arrest of 93-year-old Bill Ryan (whose ‘activist portrait’ she holds) protesting Whitehaven’s Werris Creek coal mine in 2014. Masquerading as a page from a booklet of Australian stamps celebrating our ‘21st-century navigators’, my imagery derives from activist images shot by Front Line Action on Coal in late 2014. Locking-on in protest against Whitehaven Coal’s Maules Creek mine in north-west NSW are (l. to r.) former Australian Rugby Union captain David Pocock, fifth-generation local farmer Rick Laird, and 23-yr-old student Chantelle Brown from Wauchope. Australia Post’s original Australian Navigators series (1963) featured Cook, Tasman, Flinders etc. Williams River Valley Artists’ Project @ Cementa15 contemporary arts biennial in Kandos (regional NSW). Our installation of individual works in the Kandos Scout Hall was activated twice each day by a short, empathetic performance inspired by the courage, ingenuity, discipline and stamina of environmental activists from all walks of life 'locking-on' against new coal and CSG. Acknowledging the role of witnessing in non-violent direct action, the piece drew upon the back-stories of a number of activist portraits (mounted in clusters upon the floor). Our final performance was most memorably (and unexpectedly) for a group of recently-arrested activists en route (from Sydney) to their court hearings in Narrabri. In preparation for the Cementa15 event, WRVAP artists researched community response to the crisis of coal and coal-seam-gas mining in NSW, and to climate change generally, through participation in blockades of the Leard State Forest, Gloucester and Newcastle by non-violent direct action. Williams River Valley Artists’ Project (WRVAP) is a collective of environmentally-concerned Australian contemporary artists: Juliet Fowler Smith, Noelene Lucas, Margaret Roberts, Neil Berecry-Brown, Suzanne Bartos, Toni Warburton, Sue Callanan and David Watson. Juliet Fowler Smith formed WRVAP in 2009 to oppose an ill-conceived $400 million dam on the Williams River near Dungog, 200 km north of Sydney. The proposed dam at Tillegra would have flooded kilometres of river valley, precious eco-systems and indigenous/settler histories, destroyed the livelihoods and social fabric of local communities and wiped ‘Manns Hill’ - the property farmed for five generations by Juliet’s family - from the map. After years of sustained grass-roots opposition and a rising tide of public dismay, plans for the Tillegra Dam were eventually shelved by the NSW government in late 2010. In 2012 we turned our attention to another pressing regional, now decidedly global, environmental issue - the insidious, elephantine threat of Big Coal and CSG - linking up with campaigns by Lock the Gate, Front Line Action on Coal, Protect Gloucester and 350.org. From 2009-16 WRVAP mounted eight exhibitions (three at NSW regional galleries) and published two agit-prop newspapers/ catalogues: The Stuttering Frog #1 for the exhibition Cry Me a River (2010) and The Stuttering Frog #2 for Leave It in the Ground (2013). williamsrivervalley.blogspot.com.au charts our regional residencies, research, exhibition, performance and publishing activities. See also Cry Me a River, Riparian Rites, Leave It in the Ground and While We Sleep.